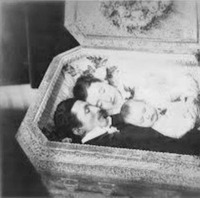 I've seen pictures of mothers and newborns in the same coffin, but I think that this is the first picture I've seen of a whole family in the same coffin. Usually when two or more family members were buried in a single coffin, it was because they died at the same time. The majority of such burials were/are women who died, along with their infants, during childbirth. When two children, a father and child, etc. 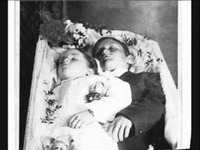 were buried in the same coffin, it was most often because they died together in an accident such as a road mishap or from something like gas inhalation. Did you see the photo of the whole family laid out dead on the bed at whatliesbeyond.boards.net/thread/6376/photos-secure-shadow-substance-fades ?